Seahorse Gardens lies between Fly Point and the Marina. The site was given its name by Dave Harasti who conducted extensive research on local seahorses at the site (look at http://www.daveharasti.com/ for more information). To access the site, park on Victoria Parade in front of the toilet block and walk across the beach into the water. This is one of the easiest sites in the bay for entries and exits, and the toilet block has showers which are great for rinsing off after the dive. Diving the site is tidal, although the site can be dived up to two hours before high tide, and the best visibility occurs around high tide. Between high and low tides strong currents sweep past the point and diving is not advisable. Generally the currents at Seahorse gardens are driven by an eddy and run counter to the tide direction, so on an incoming tide the current tends to run outward! Also note that the main boating channel from the marina runs straight over the site and boat traffic is heavy especially at weekends. On entering the water the diver is faced by a shallow slope of sand. This changes to seagrass at a depth of around 2m which changes to sandy rubble once a depth of 5m is reached. The beach curves and at the entry point it faces approximately North-East with the Marina to the South-East. 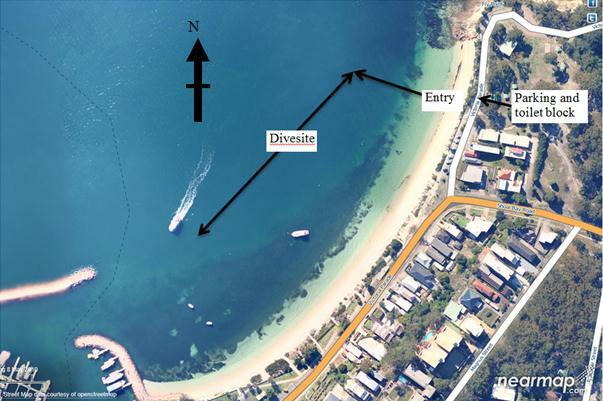 The usual dive plan is to head North-East down the slope till the desired depth is reached (usually 8-10m) and then turn South-East towards the marina, then reverse bearings to return to the beginning. The focus for this dive is generally macro. It is the best site in the bay to find anglerfish, and one of the best sites for finding seahorses(along with the Pipeline). It is also a great site for finding nudibranchs and unusual tropical fish seem to hang out here in the summer perhaps because of the eddy current. Another big attraction is the extensive areas of soft corals which host seahorses, pipefish, rhinoceros crabs, cowries, and anglerfish if you are lucky. The site also seems to have an unusual array of different anemone species.